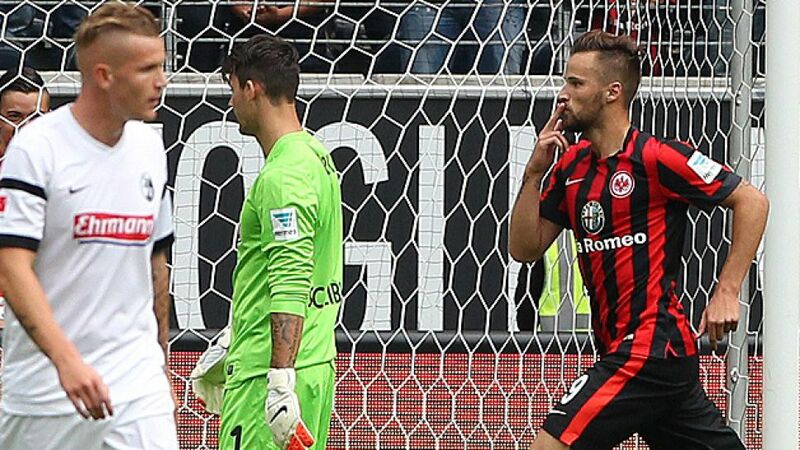 Frankfurt - Haris Seferovic gave Thomas Schaaf an ideal start to life as Eintracht Frankfurt coach with the only goal of the game against SC Freiburg. The Swiss beat his compatriot Roman Bürki with a neat finish 15 minutes in, for not just his first goal in German football but also his third against the new Freiburg custodian - his only two Swiss Super League goals for former club Neuchatel Xamax FC both came against the then Grasshopper Club keeper. The goal came somewhat against the run of play with Freiburg looking the more lively and adventurous, but apart from a Jonathan Schmid effort, they had rarely threatened Kevin Trapp's goal. That was the story of the second half too with Frankfurt happy to soak up the pressure. Trapp did well to deny Schmid again before he thwarted Switzerland's World Cup star Admir Mehmedi. The energy tanks started to empty, however, with Frankfurt wasting the last chance of the game through Johannes Flum, who perhaps did not want to do his former side any further damage four minutes from time.